The funeral of Mrs. Mary T. Hummel, 22, of 649 Northampton St., Easton, was held this afternoon at the Ashton Funeral Home, Easton. 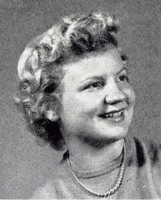 mrs. Hummel, a teacher in the Lopatcong Township Elementary School, died Monday (May 15, 1961) at the Universary of Pennsylvania Hospital, Philadelphia. She was the wife of Conrad C. Hummel.